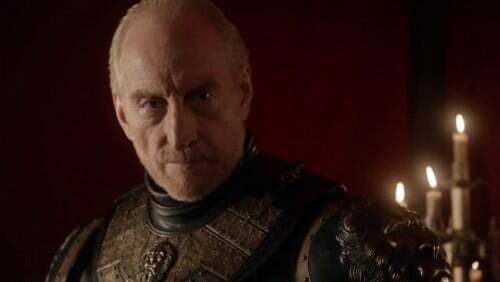 The Lord of Casterly Rock and Warden of the West, Lord Tywin is the wealthiest and among the most powerful magnates of the realm. Cold, calculating, and commanding, as a young man he was friend and Hand to King Aerys, and held the great ambition of seeing his daughter Cersei wed to Aerys’s heir. As Aerys descended into madness—marked both by paranoia and megalomania—their relationship grew strained, and finally broke beyond repair when Aerys took Tywin’s young heir, Ser Jaime, into the Kingsguard (thereby making him ineligible to inherit the Rock). Lord Tywin repaid this at the end of Robert’s Rebellion when he sacked King’s Landing and put Prince Rhaegar’s wife and children to the sword. When Lord Tywin’s blonde hair began to grey, he shaved it, retaining only golden whiskers. Though nearer to 60 than 50, he is lean and fit as a man twenty years his junior. Tall and spare, his green eyes—a family trait—are hard. He almost never smiles, and he cannot stand laughter. The actor cast in the role is approximately 10 years older than the part as described in the novels.